Eric Lundgren, a California man who made a living recycling electronic waste, has been given a US$50,000 (about £35,000, AU$66,000) fine and a 15-month prison sentence for burning thousands of Windows restore discs. Lundgren made 28,000 discs in total. He intended to sell for 25 cents each to PC refurbishers, but they were seized by US customs officers. Restore discs are usually provided free with new PCs sold with Windows already installed. 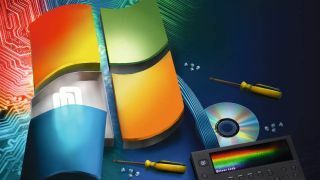 The ISO image they contain can be downloaded free from Microsoft, but the operating system can only be activated with a valid license. Lundgren argued that the discs by themselves had no value, but at his trial the court ruled that the discs were worth US$25 (about £20, AU$30) each, and that the infringement cost Microsoft a total of US$700,000 (about £500,000, AU$900,000). Lundgren made a name for himself in recycling e-waste, with a company that repairs and reuses over 41 million pounds of defunct electronics every year. “Microsoft actively supports efforts to address e-waste and has worked with responsible e-recyclers to recycle more than 11 million kilograms of e-waste since 2006," Microsoft said in a statement to The Verge.